MLB.com At Bat – From Spring Training to the World Series, the Major League Baseball season is long and sometimes arduous. Get your off-season fix while you’re waiting for the new season to begin, including archives of classic games filled with historic moments in baseball. When the season begins, MLB.com At Bat keeps you up to date on all the movers and shakers in pro baseball, with Gameday Audio, video highlights, news and live look-ins. Never miss the results of a big game again! theScore Mobile – This free app has been named one of Apple’s Amazing Apps for iPhone 5 and is a member of the App Store Essentials Hall of Fame. Whether you’re following all of your favorite teams as a fan or monitoring the performance of your fantasy players, this app delivers all the scoring and statistical information you need to stay on top of each and every game. Ultimate Fight Fan: Top MMA, Strikeforce & Ultimate Fighting news & videos – If you like your sports a bit more on the full-contact side, the free Ultimate Fight Fan is the app for you. Keep up with your favorite fighters’ win/loss stats and match information. The app grants access to the official UFC Facebook wall and MMA News, along with headlines, upcoming fight card, match recaps and promotional videos to keep you pumped for the next fight. Pro Football Insider – The NFL fan is in a league all of its own, which is why this free pro football-dedicated app is a must have for any die-hard supporter. Quick access to stats, standings and schedules keeps you up to date on the teams you support, while integrated Twitter feeds allow you to see what your favorite players, experts and analysts are saying about the big game. FOX Sports Mobile – If you are a multi-sport fan supporting lots of teams across several leagues, this free app may streamline your approach to stats and standings tracking. With support for motorsports, MMA, boxing, soccer, tennis, golf, NHL, NBA, WNBA, men’s and women’s NCAA Basketball, MLB, NFL and NCAA football, Fox Sports Mobile keeps you in the loop at all times. Users can also access information from exclusive analysts and FOX Sports writers. ESPN College Football – College football lies somewhere between sport and religion for devotees, which is why this free app offers year-round press updates, highlights and full coverage. When the season starts, stay informed as the big plays happen with scoring alerts and keep an eye on your customizable scoreboards to make sure that you’re always in the NCAA Football loop. ESPN Fantasy Football 2012 – If your favorite football team is a fantasy team, then this is the app for you. With push notifications for scoring plays, substitutions and injuries, you can manage your fantasy team with ease, no matter where you are. NASCAR Mobile ‘13 – Some teams manipulate a ball, while others dominate a race track. Fans of NASCAR racing shouldn’t overlook this free app, which offers year-round coverage of everything from the Sprint Cup to the Camping World Truck series. Keeping up with your favorite drivers’ performances is a snap with NASCAR Mobile, even if you do miss the adrenaline rush of seeing the big win happen. WatchESPN – Sometimes you just have to see the game, even if you’re going to be on the road or away from a television. That’s where this free app comes in handy, offering you unfettered access to ESPN, ESPN2, ESPN3 and ESPNU. 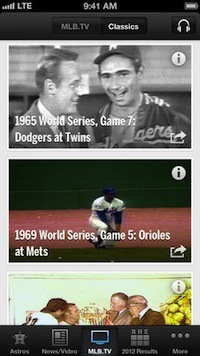 If ESPN is part of your cable package at home, you can watch from wherever you happen to be on your iPhone. Yahoo! Sportacular – An App Store Essential, inductee of the App Store Hall of Fame and named one of the App Store Great Free Apps, Yahoo! Sportacular delivers updates, breaking news, scores and stats quickly and efficiently, helping you keep up with the stats of your favorite teams and individual players. Many thanks to community member Kenny Myers for sharing his blog with Sports Techie. Sports Techie, How can we go wrong with any one of these top ten iPhone apps provided by Kenny for tracking your favorite team’s stats. When you have ESPN, Fox Sports, NASCAR, MLB, and MMA, on the list, you are on the right track. Free is always a good thing when using a new app. Other mandatory tech features to look for include: video, audio, schedules, stats, trending sport and player news, and Live games or events. Interesting to note that with Spring Training here, At Bat by MLB.com sits at number one and for good reason. It’s loaded with tech features made for a Sports Techie fan of MLB statistics and fantasy baseball. With Fox poised to take over the number two sports media brand overall when they launch FS1 latter this year, it makes sense to pay special attention to Fox Sports Mobile in 2013, especially for MLB content and NASCAR data. It is surprising to see theScore Mobile at number two overall but they are in the App Store Hall of Fame which gives them Klout with me. Give them a try during the NCAA college basketball March Madness tournament. Ultimate Fight Fan has serious merit at number three. I often use the official UFC app for the iPhone which is also loaded with relevant training, fight and venue content. Pro Football Insider at number four has serious social media integration with Twitter, which I personally see as a must have feature for learning about breaking news, insider info, and expert NFL analysis. Kenny has ESPN football madness but I understand why when it comes to running your NFL fantasy football team, or paying attention to your favorite college football teams’ stats. Watch ESPN is the all everything app for digital viewing of sports, especially for us Comcast Xfinity customers who love NBA stats. What I like about NASCAR Mobile 13′ is how this innovative company took digital media in-house in a wise sportsbiz move. You can be sure that this applications content plus the look and feel of the NASCAR iPhone app, will all be much closer to what racing fans who love driver, crew and track stats, really want. Yahoo is hanging onto 10th place with their Speculator app. Not sure it they are on their way up or down this custom list but the app does have tons of useful sports data. If you like to lay down bets, I suggest you try all ten of Kenny’s favorite apps to get the latest real-time, sport and stats updates, Sports Techie. Tracking your favorite team’s stats with an iPhone by Apple is more fun and easier than ever. Tags: analysis, App Store, Apple, Apps, audio, baseball, basketball, betting, Comcast, data, digital, ESPN, Facebook, fans, Fantasy Sports, Fight, football, Fox Sports, free, Game, Gameday, iOS, Klout, March Madness, MLB, MMA, mobile, NASCAR, NBA, ncaa, NFL, racing, schedule, score, Social Media, software, Sports Techie, sports technology, sportsbiz, team, technology, Track, trends, Twitter, UFC, video, Xfinity, Yahoo! Every weekend i used to pay a quick visit this site, because i want enjoyment, for the reason that this this web site conations genuinely good funny stuff too.